Harry will spend his first February 14 as a married man thousands of miles away from the Duchess of Sussex. He will be meeting troops who are being trained in survival in one of the world’s most demanding environments as part of Exercise Clockwork in north Norway. Set 200 miles (322km) inside the Arctic Circle, more than 16,000 Royal Marines and Royal Navy sailors and airmen have taken part since 1969. Harry’s visit marks the 50th anniversary of Commando Helicopter Force and Joint Helicopter Command deploying to Bardufoss in Norway. Military personnel are taught how to survive, operate and fight in the sub-zero conditions and gain experience of operating aircraft in severe cold weather and mountainous environments. The multinational exercise, hosted by the Norwegian Armed Forces, comprises Environmental Flying Qualifications, Cold Weather Survival, Tent Group Commander and Snow and Ice Driving Courses. The duke, in his role as Captain General Royal Marines, will fly to the Air Station in Bardufoss on February 14 to meet military personnel living and training across six months of the year on the base. Harry will also see field tents, snow vehicles and a Quincey Shelter – a makeshift shelter built of snow in which the elite forces are able to camp. 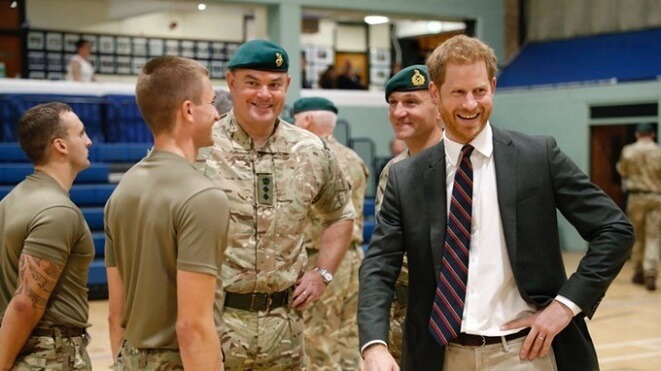 Harry was appointed Captain General Royal Marines in December 2017, taking over the role from his grandfather the Duke of Edinburgh who held the appointment for 64 years. The duke already has experience of colder climates, facing temperatures as low as -35C on charity expeditions. Harry took part in treks to the North Pole in 2011 and South Pole in 2013 with Walking with The Wounded.